I was surprised this week by this pretty cream and pink canna, blooming among some shrubs near the garage. It’s a short variety, and I need to move it to a place where it will get a little more attention. This is another small canna currently blooming near the patio. They are all I’ve found in our flower beds, which is a little strange since cannas are such a common plant here. This is my favorite local variety. It’s medium tall and the blooms are clear orange. These are my neighbors’ cannas, planted outside their garden walls. 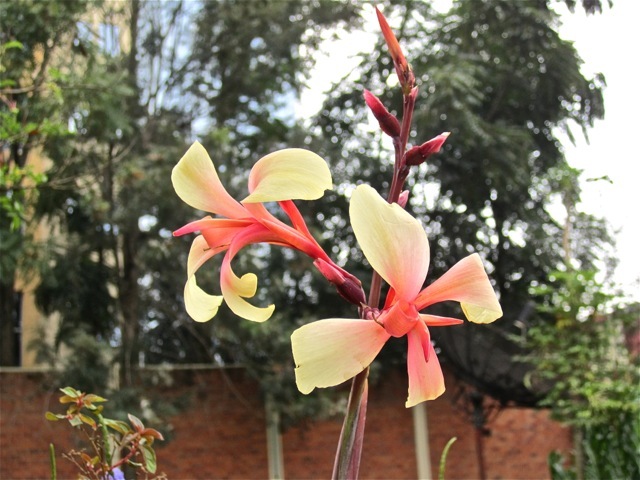 Cannas are so common in Africa that you might think of them as native plants, but all cannas are native to the Americas. In the U.S., they range from southern South Carolina, west to southern Texas. Cannas like full sun and consistently moist soil. They have a high tolerance for contaminants and can be used to extract pollutants from wetlands. The blooms and foliage of cannas have such a strong presence that I think they need to be placed in gardens that are rather dramatic in return and maybe somewhat tropical. Beautiful use of burgundy-leaved cannas in front of the Smithsonian’s Museum of American History, Summer 2011. 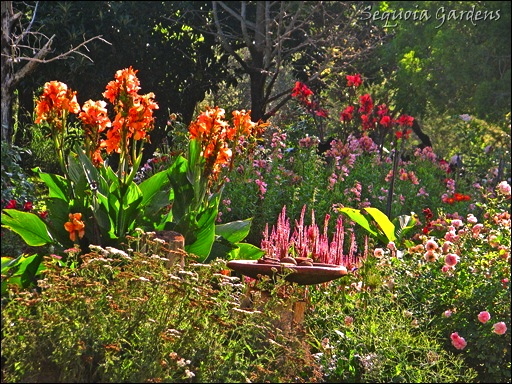 Here is a nice old-fashioned garden bed with canna from the South African blog Sequoia Gardens. Of course, they’re great in showy pots. 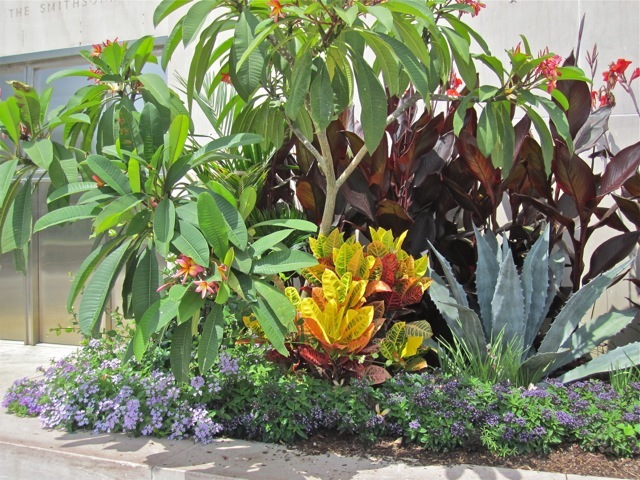 Cannas and coleus at The Morton Arboretum, via This Garden Cooks. I found an interesting online newsletter, Old House Gardens, which offers a lot of history and advice on the use of cannas. 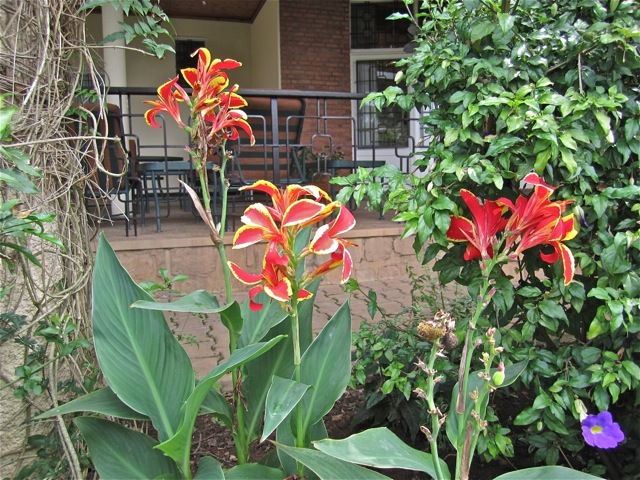 It reports that Georgia gardener Ryan Gainey uses Canna indica (commonly called Indian Shot) in a big clump with chartreuse ‘Limelight’ hydrangeas and yellow ‘Hyperion’ daylilies. For cannas with reddish-purple or bronze leaves, Mitchell recommended pairing them with plants of gray and bronze foliage, as well as straw-yellow, buffy, or sharp lemon flowers like daylilies — or with figs, pomegranates, or “chest-high mounds of gray wormwood and black-green yews.” It is perfectly OK to cut off the canna flowers if they are “too flashy” for you. Thanks to May Dreams Gardens for hosting Garden Blogger’s Bloom Day. Victoria in London, has a dramatic tropical garden, graced with cannas. The Indian shot is invasive here. Would that ‘Indian’ be Native American if they are all from NA? It seems that Canna indica is called ‘Indian Shot’ because of its resemblance to the lead shot ammunition of the 18th and 19th centuries. I think there is some speculation that it was sometimes used as a substitute — maybe by native Americans. 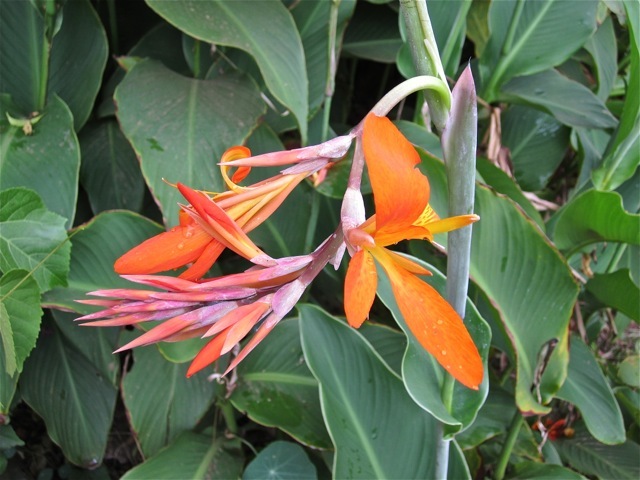 Canna indica is native to the warmer regions of North America and the Caribbean. Interestingly, it was taken to Asia (East Indies) first, then to Europe and Africa, thus the confusion caused by the name ‘indica’ (India). It was known in Europe by the early 1600s. It is definitely invasive in South Africa. On the National Environmental Management Biodiversity Act (NEMBA) list, it is in category 1, “Remove and destroy.” So far in Rwanda, I have mostly only seen it in gardens, so I don’t think it’s a problem here. I looked at the pictures of your garden on your blog. Beautiful conifers and peonies! Great information! I have cannas in my garden, but didn’t know there were from the Americas. Love all the pics. Your pink and cream canna is so unusual. Very pretty. I was really pleased to find it. I usually just see red and orange. It feels really strange to see a sunny January, of course you are in the southern hemisphere! interesting cannas. Oh, I know. I almost felt a little guilty about posting. But I think everyone in cold climates is busy planning his/her garden and seed orders this month, so maybe it will give inspiration.